Vascular Smooth Muscle Cells (SMC) line the walls of large and small arteries, arterioles & veins, and play critical roles in Cardiac and vessel diseases such as stroke and atherosclerosis. 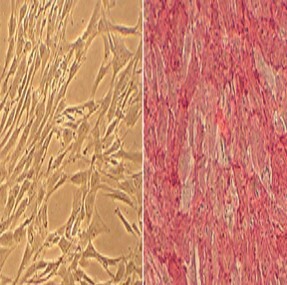 We offer primary smooth muscle cells fom different tissues, species, and vascular beds. The high purity, low passage, rigorously characterized cells are performance tested prior to release. Available frozen in cryovials or proliferating in flasks and multi-well plates, our SMC portfolio includes Total Kits paired with optimized Growth Media and Subculture Reagents. Co-culturing protocols model the interaction of SMC with species- & vascular bed- matched Endothelial Cells.